Raving beauty, rabid camera angling and startlingly somber performances almost save this movie from its own convoluted and ambitious storyline spiraling down the artsy-fartsy toilet. The trailers for THE FOUNTAIN were extremely well done and conveyed the hero (Hugh Jackman) as traveling through time, pursuing his true love across the ages (Rachel Weisz) – then I watched the movie… and I lost track of which flash-forward was which time-backward in the first flash-sideways… so I read Roger Ebert’s review for a smidgen of probable comprehension and apparently, the movie is about one time-frame with two other “fantasies” piggybacking off the reality of the main story…. If my description confuses you – wait till you see the movie. 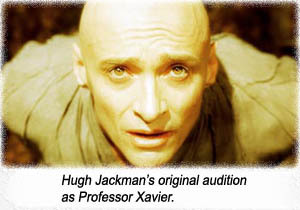 Written by Darren Aronofsky and Ari Handel, and directed by Aronofsky, the “realistic” thread is the story of a scientist (Jackman) trying desperately to discover a cure for the necrotic effects of a brain tumor on his wife (Weisz). While she dies daily before his eyes, he loses his own health and sleep experimenting on apes. Weisz keeps a diary concerning some mythical Fountain of Youth, which Jackman’s other characters pursue in other realities. I’m sure that the metaphors of the “imaginary” realities are profound, but it will require more than one viewing and about ten viewings of the “Making Of” reel to untangle those metaphors. The three “realities” are linked by the two main protagonists appearing as various characters in those realities; Jackman as a conquistador, Weisz as a Spanish queen, Jackman as a shaved-headed recluse in a space-bubble – wha-? I’m telling ya, this thing is WEIRD with a capital D.
It would be easy to dismiss THE FOUNTAIN as a failure, but then we are haunted by the fact that in misunderstanding Aronofsky’s vision or depth, we’ll be called ersatz reviewers and never be invited to another SPIDER-MAN screening. This cucumber concurs, Mr. Berardinelli. Writers: Darren Aronofsky, Ari Handel. Starring: Hugh Jackman, Rachel Weisz, Ellen Burstyn, Mark Margolis, Stephen McHattie, Cliff Curtis, Sean Patrick Thomas, Donna Murphy, Ethan Suplee.